Why consider classical, Christian education? 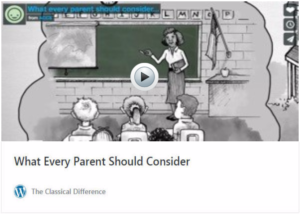 Consider this short video that proposes what parents should consider as they make an important decision about their children’s future. Be introduced to: Classical, Christian Education! It is the right choice to help your child live a virtuous life to their full potential while valuing truth, goodness and beauty.